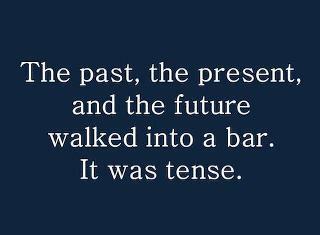 Thanks to a non-linguist, Celia Boone, for this. The future wasn't so much tense, but moody. I don't mean to be "Unknown." but the Blogger comment posting system is funky. I found the joke lacking in certain aspects. Progressive Aspect was still drinking after Perfect Aspect had finished. There are more aspect jokes one could make here (Iterative, Habitual and so on) but I don't want to just keep on making them; it would look like I can't stop.